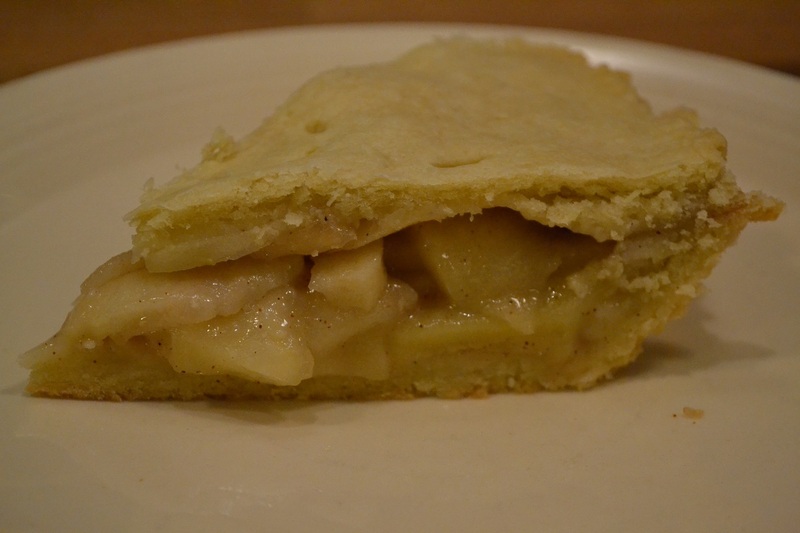 Phew…months later…I am finally writing down what I did for my first ever homemade apple pie with double-crust. You may remember that we liked the outcome of the apple pie (single crust) https://ourfunstuff.wordpress.com/2014/07/25/first-try-apple-pie/. However, Hans and I agreed that if the pie had a double-crust, the apples would likely have stayed more moist AND made the pie even more scrumptious. So here is what we did to create the pie. 1. Make sure that the oil and water is ice-cold. This will make the dough flakier. 2. Add all ingredients together to make a smooth dough. I ended up hand-mixing the dough. Once the dough is done, place it in the refrigerator for one hour. 3. Preheat oven to 350 degrees F. Roll out half of the dough on a floured surface and place into greased pie baking dish. Bake for 7-10 minutes to allow pie crust to set for filling. Meanwhile you can prepare the pie filling. 1. Combine all ingredients in a large bowl and gently stir to mix ingredients. 2. Pour the mixture into a mediums-sized pan and heat slowly on low to medium heat for 5-10 minutes, or until apples reach desired “doneness.” We found that heating the mixture and stirring it, helps to evenly coat the apple slices with honey and sugar. 3. Fill the mixture into the prepared crust. Roll out the second half of the dough and cover the apple slices. Make sure to seal the pie crust edges. I usually use a fork to gently press down to seal the edges. Bake at 350 degrees F for 30-45 minutes, or until golden brown and apples are tender. …the cover needs holes to vent…so I got a bit creative. Pie edges held up pretty well. Make sure to not cut dough too small as it seems to shrink. Categories: Cookies & Other Treats, In The Kitchen | Tags: apple, apple pie, Homemade | Permalink. It’s pretty obvious that I love butternut squash, but we also had butternut squash left over from making butternut squash risotto https://ourfunstuff.wordpress.com/2014/12/26/scrumptious-butternut-squash-risotto/. So after thinking about what to make with the left-overs, I decided that it would be worth a try to make home-made butternut squash ravioli. I couldn’t have done without the help of Hans. He did all of the hard work from making the dough to making the ravioli. So here is what we did. 1. Add flour to a medium bowl and create a deep, wide well in the center. Pour the eggs, olive oil, and salt into the well. Start by mixing the eggs with a fork and then slowly start mixing the flour in from the sides. Once the dough starts to move as a unit, empty the bowl onto a floured surface and knead the dough by hand for several minutes, or until the dough forms a nice ball.The dough should be smooth and homogenous. Knead in more flour, if it still feels sticky. 2. Cut the dough into smaller pieces to be run through the pasta maker. We started with size 1 and slowly increased the level to 5. Level 5 yields a thin layer of dough that we laid out flat to use to make the ravioli. 3. Peel the butternut squash and cut into cubes. Heat the butter and olive oil in medium-size pan. We sautéed the whole butternut squash and used half of the sautéed butternut squash for Butternut Squash Risotto and the other half for this recipe. Add the salt, pepper, and chili powder. Once the butternut squash has been sautéed, use potato masher to mash the butternut squash. Add a bit of freshly grated Pecorino Romano cheese and stir until mixed. 4. Place about half a teaspoon of mashed butternut squash onto the dough. 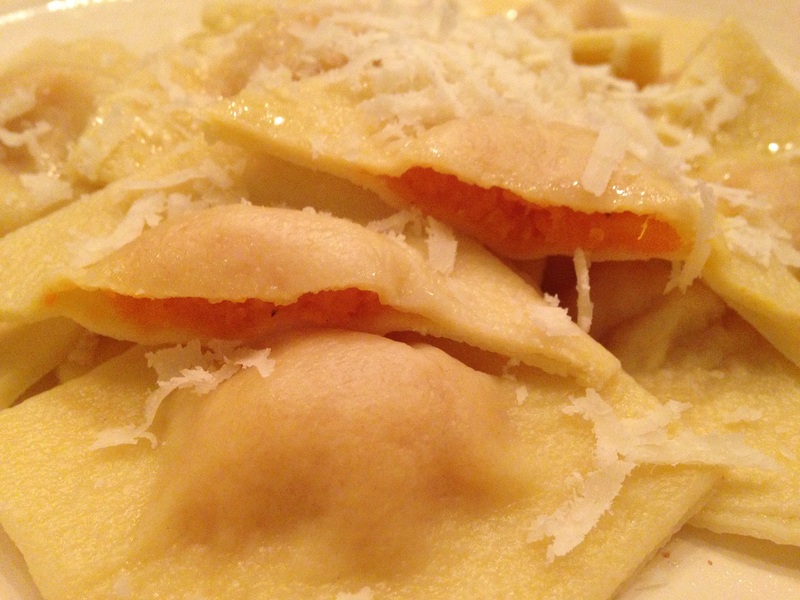 Leave some space between the mashed butternut squash to be able to shape distinct ravioli. Cover with another strip of rolled out ravioli dough. Gently press down on the edges to seal each ravioli. Cut the ravioli. This dough and half of the butternut squash will make approximately 60 ravioli. 5. Place ravioli into rapidly boiling water and cook for 4-5 minutes, or until dough is done. Meanwhile, melt 2 tablespoons of butter in a small pan. Drain ravioli. Arrange on plate or in flat bowl. Drizzle with a bit of melted butter and sprinkle with more cheese shavings. Enjoy! We only used half of the butternut squash for this recipe. This can be sauteed longer than for Butternut Squash Risotto. Then mash it. Add ravioli into rapidly boiling water. Categories: In The Kitchen, Main dishes | Tags: butternut squash, home-made pasta, Homemade, pasta, ravioli | Permalink. Hmmmm…pizza. I have to admit from time to time we endulge in cheese pizza from Costco…but there is just something magical about making pizza from scratch at home. Whenever we make homemade pizza, we use the following dough recipe. 1. Please yeast in the bowl, and pour warm water in bowl. Stir in the sugar, mix with a fork, and allow to stand until the yeast has dissolved and starts to foam (5-10 minutes). 2. Use a wooden spoon to mix in the salt and about one third of the flour. Mix in another third of the flour, stirring with the spoon until the dough forms a mass and begins to pull away form the sides of the bowl. 3. Sprinkle some of the remaining flour onto a smooth work surface. Remove the dough from the bowl and begin to knead it, working in the remaining flour a little at a time. Knead for 8-10 minutes. By the end the dough should be elastic and smooth. Form it into a ball. 4. Lightly oil a mixing bowl. Place the pizza that is lightly-covered in oil (to prevent forming a “skin”) into the bowl and let the dough rise for 40-50 minutes. 5. After the rising period, we usually split the dough into equal halves: One half to use to make the pizza crust, the other half gets wrapped with plastic wrap. It can be stored for several days in the refrigerator. 6. Roll the dough out and place directly on a pizza pan. Note: this makes 2 large round pizzas. We often make just one pizza and store the other half of the dough in a ziplock bag in the refrigerator. Make sure to use up the dough within 1 week. Alternatively, just use half of the dough ingredients and make half the dough. Categories: In The Kitchen, Main dishes | Tags: Homemade, pizza dough, vegan, vegetarian | Permalink.